The government of Taiwan has embarked on an ambitious plan to embrace the renewable energy revolution. As part of President Tsai Ing-wen’s plan to phase out nuclear power plants and reduce the use of fossil fuels, the government intends to invest as much as $56.6 billion, and to raise the percentage of renewable energy in Taiwan’s energy mix to between 20% and 25%. This represents as much five times the current level and is set to be achieved through a range of adaptation and mitigation measures. The government of Taiwan has also embarked on a number of signature renewable energy projects in order to raise awareness and to showcase how such technologies work along with their major benefits. One such project is Taiwan’s national stadium, that was built to host the 2009 World Games, which generates 100% of its electricity from photovoltaic, solar technology. Capable of holding up to 50,000 people, The Guardian reports that the roof of the stadium is covered by 8,844 solar panels comprising 14,155 square metres in space. These are enough to effectively and sufficiently power the 3,300 lights in the stadium as well as two jumbo viewing screens. During periods when the stadium is not in use, the renewable energy generated by the solar panels is fed into the local grid and is capable of meeting almost 80% of the surrounding community’s energy requirements. To further promote the uptake and use of solar power the national government has implemented a moratorium on nuclear power and signalled a commitment to completely phase it out by the year 2025. The World Nuclear Association reports, that at present, Taiwan currently has six operating nuclear power reactors while a further two advanced reactors are under construction. Nuclear reactors are expected to be closed down after they reach 40 years of service. Taiwan’s first offshore wind farm is currently being developed and is scheduled for completion in 2019. Known as Formosa I OWF, it will be located three to six kilometres of the west coast of Taiwan, and is expected to produce up to 10 GW of clean energy over the course of 15 years which could further increase by as much as 10 GW every single year if the offshore site is expanded. 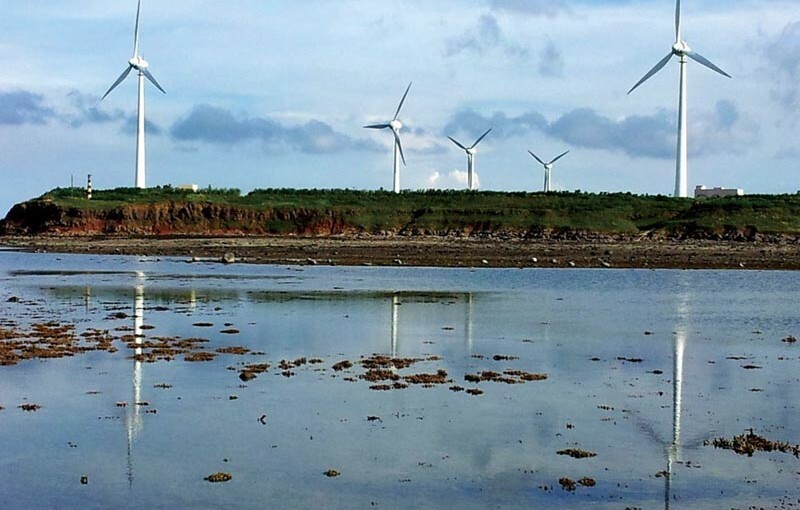 Other offshore wind developments are expected to commence in the coming years which will help Taiwan generate increased amount of renewable energy and reduce its dependence on fossil fuels. Regarding biofuels, Huang and Wu, in another academic paper of theirs, note that “The development and promotion of biodiesel in Taiwan is in the initial stage.” As an island, with limited natural resources, Taiwan relies heavily upon imports for the majority of its energy, but the government is not actively exploring ways to change this and is seeking new clean energy technologies like biofuels. Due to its extremely low sulphur content, as opposed to regular fuels, “Emissions of sulphur oxides from biodiesel are much lower that from fossil diesel” and are thus more environmentally friendly. Although at an early stage, Taiwain has great biofuel potential, as it consumes approximately 780,000 metric tons of edible oil per year, of which, around 156,000 metric tons could be recycled. Taiwan’s renewable energy revolution is an ongoing process. Led by the national government, Taiwan has adopted ambitious green energy targets which it believes will lead to enhanced economic development along with improved environmental protection. Continuing forward, challenges will be faced, and continued careful government management will be required. New innovative partnerships will need to be encouraged, additional legislative policy reforms will be required and Taiwan and the Asian region’s existing capabilities will need to be fully leveraged. Importantly, sustained investment is also required and investors, wary of the high costs involved, should then consider the potentially higher costs of not building up renewable energy capacity.